Re: Phew! I'm worn out! Sounds like you've earned a nap. Nearly finished digging patch for onions here, hoping to get them in tomorrow. Doesn't a bit of good weather make a big difference! I got me onions and main crop spuds in at last. The beds were not really fit but they will do. Parsnips and carrots need better conditions so they may have to wait a bit. The poly`s looking productive now and in the next couple of days the Toms need to be planted, they are getting a bit leggy. Looks like we will get a half decent crop of Peaches after all, a surprise this is. 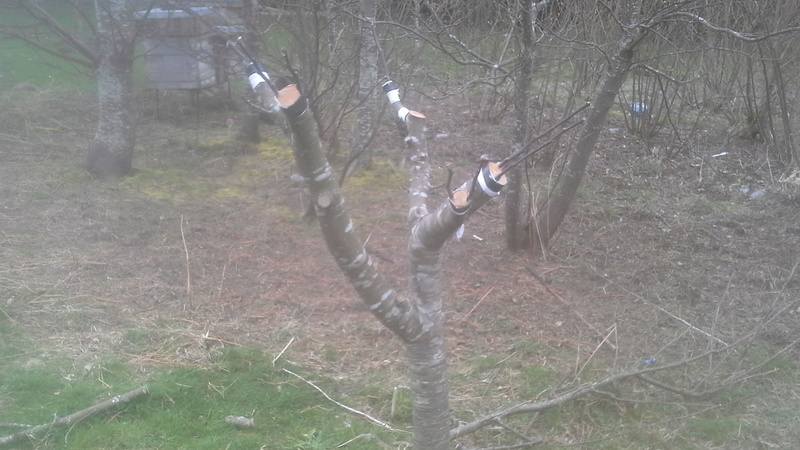 I see bud break on a fare few apple trees Sean. Is it time to think about grafting Sean? Do you use proper grafting tape? Yes, get grafting Wayland. I do use proper grafting tape, but it isn't necessary - a strip of plastic cut from a freezer bag will work just as well. I tend to finish off with a bit of electrical tape, just to make it more secure. This was a Pitmaston Pineapple I grafted over last week to Broxwood Foxwhelp.